This appeared on my blog’s dashboard yesterday. That person who was searching for Making Live Mice Explosives For Dummies must be severely disappointed upon finding that my blog does not contain any manual for explosives. How I Learned to Hate the Bomb Again. They are fast, small, and able to reproduce rapidly. 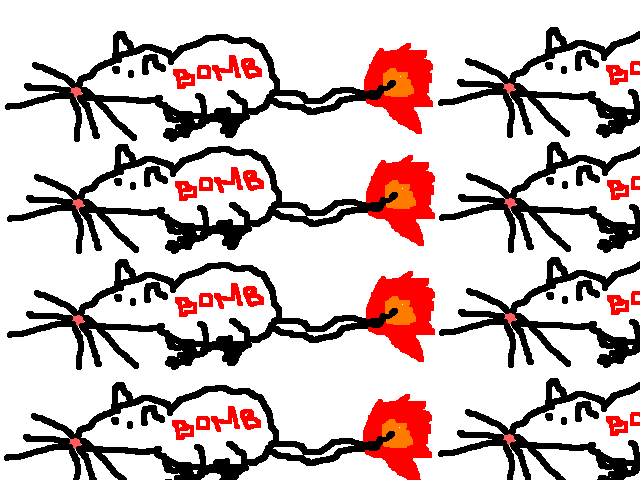 Millions of mice would make a deadly explosive force. DISCLAIMER: I do not condone any attempts to turn any animals into suicide bombers. The fact that humans are doing this to our own species is already fucked up. Heard this song about a year ago. It was my first time listening to Korean underground punk rock.